An international agreement is now in place to give special protection to the area of ocean left exposed when one of the largest icebergs ever recorded broke free from the Larsen C Ice Shelf in July this year. 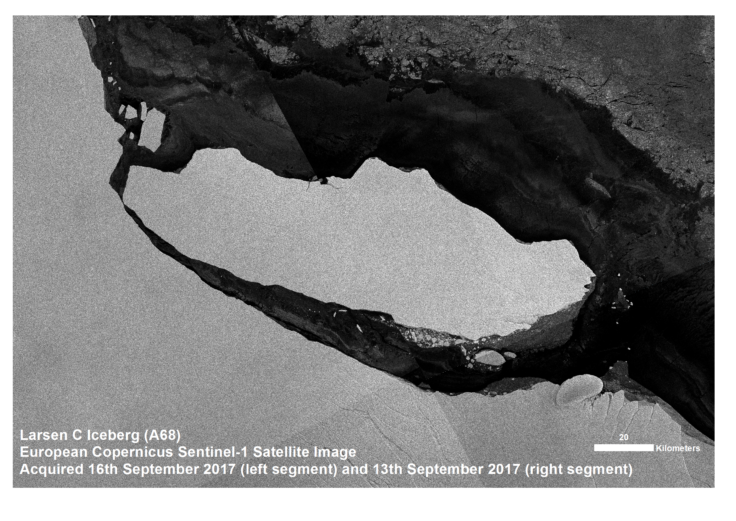 The iceberg – known as A68 – is starting to move north, and it will leave behind a 5,818 km2 area of seabed exposed to open marine conditions. 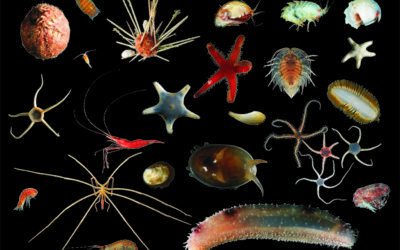 Much of this area may have been ice-covered since the last inter-glacial period around 120,000 years ago, providing a unique opportunity for scientists to study how marine life responds to this dramatic change. 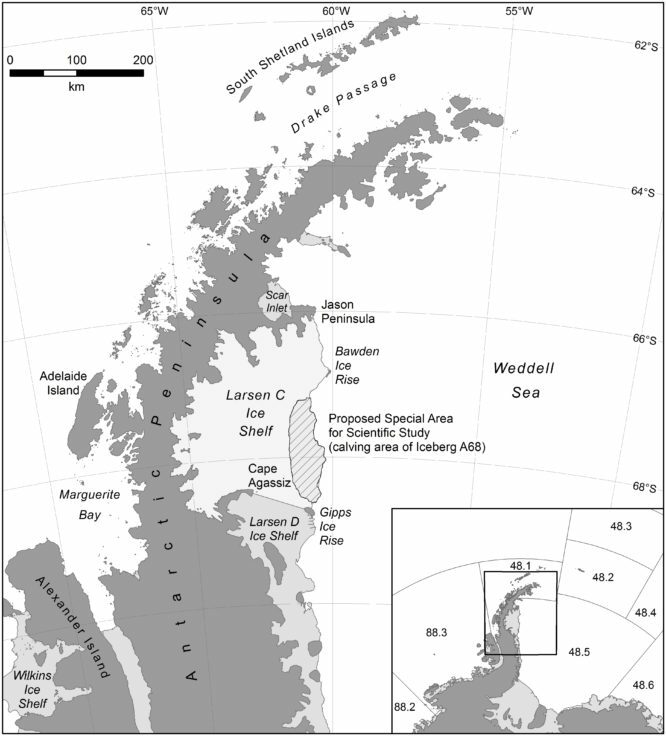 This area is the first to benefit from an international agreement in 2016 by the Commission for the Conservation of Antarctic Marine Living Resources (CCAMLR), to designate Special Areas for Scientific Study in newly-exposed marine areas following the collapse or retreat of ice shelves across the Antarctic Peninsula region. 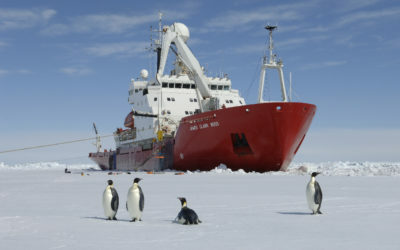 The agreement came following a European Union proposal to CCAMLR, led by British Antarctic Survey (BAS) scientists Dr Susie Grant and Dr Phil Trathan. 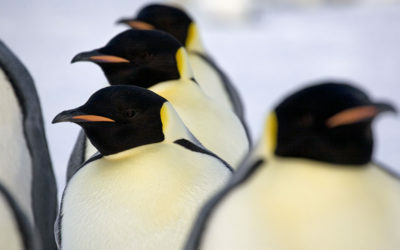 The new Special Area for Scientific Study meets the CCAMLR criteria to be automatically designated for an initial period of two years, which is likely to be extended to ten years following further consideration by CCAMLR Members. This will allow for scientific research to be undertaken in the area without any impact from commercial fishing, to address questions relating to how biological communities develop over time, and how new species colonise previously ice-covered areas. 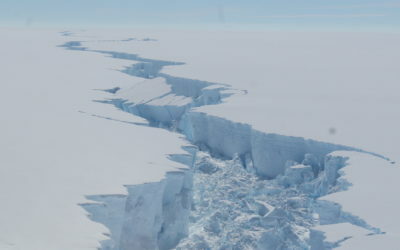 The Larsen C calving event may simply reflect the natural growth and decay cycle of an ice shelf, and is not necessarily due to changes in environmental conditions. However, studying the biological response to such events will provide an opportunity to improve scientific understanding of possible ecosystem responses to the impacts of climate change in this region and elsewhere. A team from BAS are now exploring opportunities to access the region to carry out research projects on the benthic environment.